The biggest island of the Balearics, Majorca, is the best island to visit in this archipielago if you want to choose among a huge variety of options to do or see. Ideal to go with your family to relax or with your friends to party and just disconect, Majorca has everything a visitor may expect for a perfect island holiday. Majorca is home to amazing beaches, great outdoor recreation, affordable restaurants, and a vibrant nightlife. Travellers to Majorca will find a ton of white sandy beaches with clear blue water. Some of the best beaches include Cala Sant Vicenç on the northwest coast and Pollensa Beach in the northeast. Fomentor Beach is one of the most famous spots on the island, and it is an excellent place to learn how to surf. Sa Coma Beach, meanwhile, is a great family-friendly destination. The island is home to a number of impressive historical sites. 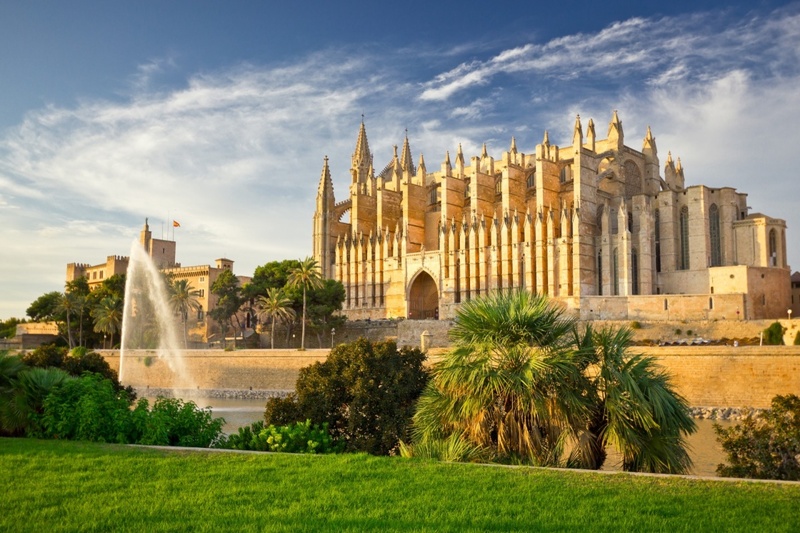 Located in the capital city of Mallorca, Palma de Mallorca, the Cathedral of Palma was first built in the 13th century and is a must-see destination. On the northwest of Palma is the Bellver Castle, a 14th century construction built in a rare circular style. By going to the top of the Bellver Castle, you can be delighted by the fantastic views of Palma and its Bay. Golf lovers will enjoy playing a round on one of the island's twenty-three scenic courses. Majorca is also an ideal spot for water sports like surfing, scuba diving, and snorkeling, and travellers will find many places to follow lessons. The Serra de Tramuntana, meanwhile, offers some top-notch hiking trails. One of the biggest tourist attractions on the island are the Coves del Drach, four amazing caves opened to visitors. Majorca is a popular destination for cyclists because of its great mountain terrain. Cycling teams frequently train on the island, but less experienced cyclists can rent bicycles and try out some of the easier roads. Although not being a really big island, Majorca offers a huge number of delicious dishes pleasing to the palate. A must try is its incredible Enssaïmada, a sweet pastry typical from Majorca, together with hot chocolate or coffee. Majorca has also Sobrassada to offer, a kind of pâté made out of the pig. Typical Majorca dishes are coocked with meat or fish and vegetables harvested in the island. These dishes include typical mediterranean ingredients such as fresh vegetables and you will find it amazing to eat them combined with a delicious Majorcan wine. Majorca offers top quality Mediterranean cuisine at a range of prices. Many of the best eateries can be found around the major resorts or in the capital city, Palma. If you want to try good tapas, La Bodega located in la Rambla of Palma is your place. There is also a special tour going on every Tuesday in the old neighborhood of the city called 'La Ruta Martiana', where a large number of bars and restaurants offer tapas and pinchos for an affordable price. One of the most famous places of La Ruta Martiana is probably the restaurant 'Molta Barra', with a nice and alternative atmosphere. For such a small place, Majorca is home to a surprisingly high number of bars and nightclubs. Palma is the best bet for those seeking a fun night of dancing. The most known area where to go to party until dawn is the Paseo Marítimo area, located in the sea promenade of the Palma Bay. The popular clubs Pacha and Tito's are in the Paseo Marítimo and are nice places where party-goers can dance all night. Mambo Playa hosts live music and is a great location to watch the sunset. There are also nice jazz and blues bars where to watch live concerts in La Lonja area in Palma. Since Majorca is such a popular tourist destination, flights to the island leave frequently from many large European airports. The Son Sant Joan International Airport is one of the biggest airports in Spain. From UK, France and Germany to many other countries around Europe you can find cheap flights to Majorca. However, depending on the time of the year and how many days beforehand you book it, it would be more or less expensive. Cruises also stop at the island relatively frequently. Travellers can also take ferries to Majorca from the nearby islands of Menorca and Ibiza. Once on the island, visitors will find plenty of buses to Palma or the major resort areas, and there is also a train service from Palma main station to the main towns in Majorca. Find information about selected Hotels, apartments and rooms in Majorca to choose the perfect place for your accommodation.